Thank you for visiting Print EZ!! Here at Print EZ we offer a great variety for all your printing needs. We take pride in great quality, excellent service, and fast turnaround to meet your expectations when it comes to any of your printing needs. Customize you printing needs.. Do it all online.. If you have a product to print we can print it for you..Our focus is to provide you with complete satisfaction. Here at Printez.com we are looking forward to serving you and making all your Print EZ! All of our orders are RUSH!!! 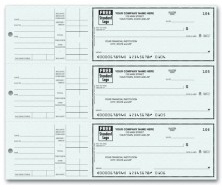 Most of our items are shipped within 24 hours..
We provide all kinds of check printing when it comes to business checks. When printing checks there is some information you need to know on ordering business checks. Business checks come in many formats. Some businesses prefer manual checks while other businesses prefer computer checks. We have many formats in manual checks and we carry many formats in computer checks as well. We have 3 checks per page in manual checks which is the most common business check. Our computer checks, as well as most of our manual business checks, ship within 24 hours. When it comes to computer checks, QuickBooks checks, Quicken checks and Peachtree checks are the most commonly used. 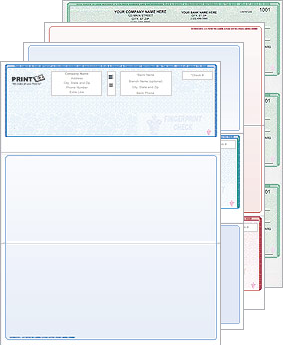 Computer checks, also called laser checks are personalized checks with your company imprint. You can buy checks that are completely blank; these are not imprinted checks. It's easy to order checks online with us. When ordering checks all you need to do is to provide all information that is on your bank checks. We sell many business forms as well. Manual Forms and computer forms are being used by almost every business. Business forms are divided in many form categories. Ordering forms are very simple. You can order customized forms or stock forms designed for your companies needs. Receipt books come in 3 per page receipts, or one per page receipts. Most forms are carbonless forms. We carry many purchase order form designs to choose from, as well as statement forms. We have great variety of sales books and sales slips. Bill of ladings come in computer format or in manual bill of lading format. Order forms today, feel free to contact us for additional information. Business Stationary is a necessity for every business. Business stationary gives your company the professional look. Match your business letterhead, business card and envelope to give your business that professional touch. Business stationary can be printed in raised ink, or colored ink. We can even add your company logo! We have a large variety of stock paper for business cards to choose from. When it comes to wedding invitations and bridal accessories we've got it all. We carry tons of wedding invitation designs to suit your needs. Customize your invitations online and see a proof of your wedding invitations online. Match your bridal accessories to your wedding invitations for that unique look. We have many holiday cards and greeting cards to choose from. Offered on our website are a large variety of Christmas cards and New Years cards that you can customize online. Proof all types of holiday cards online before ordering cards. Thank You cards and birthday cards are a great way of showing appreciation and love. Feel free to contact us on all type of cards for additional information.